When you are in Belagavi there are two structures which are visible from most part of the city, one is the Rajhunsgad (locally known as Yellur Gad or Yellur Fort) and the Suvarna Vidhan Soudha. The latest addition has also been the Tallest Flag pole. 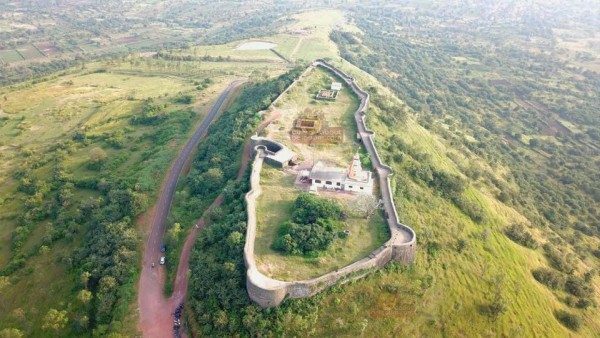 There would still be many people in the city who would have never been to this unique fort which is at an elevation of around 2,500 feet above sea level, it offers a panoramic view of the Belagavi city from all four sides. Dr C B Taboji, assistant professor and head of the Department of History at Government First Grade college, K K Koppa, near Belagavi, a member of INTACH and also an authority on forts in Belagavi district, has said that the fort was built by the Ratta dynasty and later rebuilt or renovated in stone by Asad Khan Lari, a Persian noble of Bijapur, while the Belagavi Fort was being built. The fort mainly served as an outpost of the Belagavi fort, mainly to spot and prevent the enemies attacking from Goa and Karwar areas. The Belagavi Fort and by extension, the Yellur Fort, was controlled by many rulers. Yellur Fort mainly served as a ‘watchtower’ as it allowed one to spot enemies approaching from a great distance due to its elevation. According to Taboji, the fort has withstood three wars: the first one between the Nawabs of Savanoor and the Peshwas, the second one between the forces of Tipu Sultan and the Peshwas, and the third war between the officials of the Bhimgad Fort and the Rajhunsgad forces. During the British rule, around 100 soldiers would be posted here for the protection of the fort. Several war weapons, food, and water supply were made available at the fort by the Belagavi rulers for the soldiers’ use. 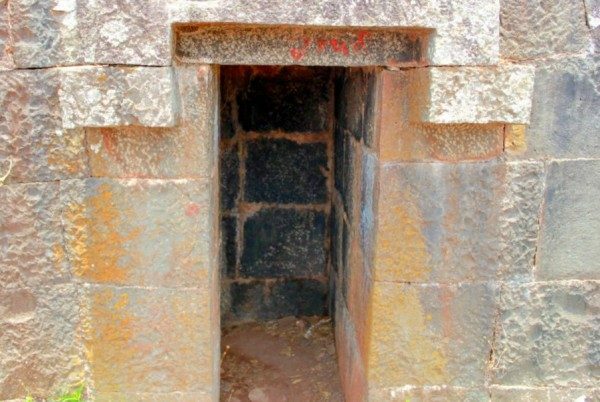 Legend has it that a tunnel from the Yellur Gad is directly connected to Belagavi Fort. A depression covered by thick bushes is seen at the fort and there are loose stones that cover what could have been an entrance to a tunnel. The fort stands on an interesting topography. Yellur village, for long, has been a part of the fertile plateau located amidst the tapering ends of the Western Ghats surrounding Belagavi city. Areas like Sulebhavi-Balekundri, Ambewadi and Yellur are a part of the fertile soil that produces rich yields of paddy, lentils, vegetables, pulses and many such crops. The hillock that the fort is built on has about five levels. So, the view of the fort changes as one moves towards the top of the hillock. It can be ascended by foot, which is the best way to experience the historical fort, or by road, which takes you right up to the main entrance of the fort. 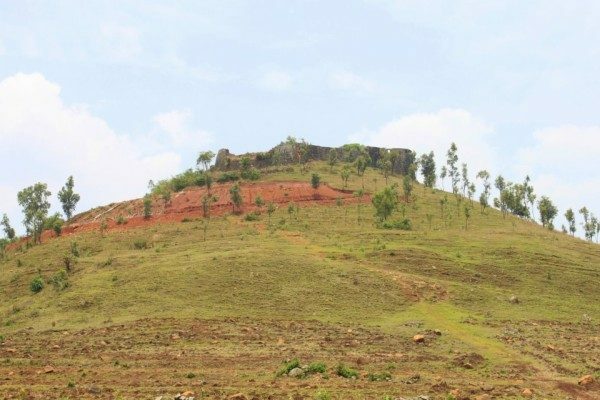 The soil on the hillock is shining white indicating traces of bauxite, the principal ore of aluminum. The main entrance door of the fort is grand but its design is deceptive. 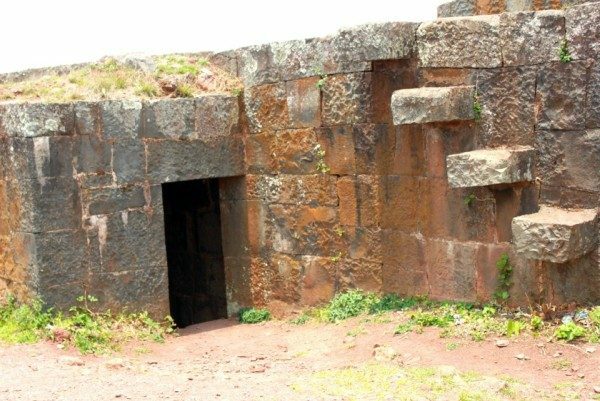 One has to take a turn to enter the door which means that the sentries would have seen you from at least three directions before you stepped in there. An arch flanks the door, which leads to the inside of the fort. Though not very large, the fort could accommodate the soldiers deployed there. A structure that appears to be a granary stands in a dilapidated condition. Also, a structure that looks like the foundation of another building could have been some kind of a settlement for the soldiers. One of the prominent structures at the fort is the well that is today fed with water from the base through pumps and pipes. It has been properly covered with an iron grill. The steps leading inside the well are sturdy and its inner walls have arches with a proper pulley facility to draw water. Another structure found here is the temple of Shiva. The temple has been renovated recently. The fort is surrounded by strong walls on all sides, with ample peepholes for the guards. At one point of the fort, you can see a binocular window, through which one guard can watch opposite ends at the same time. Interestingly, the walls have small exit routes where one has to bend and enter in pitch-dark. These routes were probably used to come out of the fort in times of emergency, without alerting enemies who may have breached the fort. Small forts like Yellur Fort may not have splendid tales to tell of battles fought and valour exemplified, but they stand testimony to the fact that such citadels served as check-posts to ensure the safety of a larger population. Awareness about such interesting structures and proper maintenance by the authorities would ensure that the structures stay intact for a long time, telling their own tales of yore. Originally authored by Swatee Jog and published in the Deccan Herald. 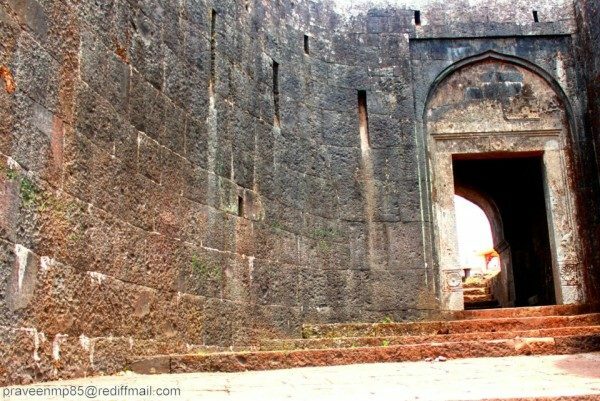 Amazing story of Yellur Fort!! !